The Jersey Devil mystery creature is believed to be, by many, a very real animal. Many individuals believe that it is simply a legendary mythical creature. The story regarding this creature dates back to the time in which New Jersey was actually a British based colony. A lady by the name of Mrs. Leeds made the discovery that she was pregnant with a child - her thirteenth to be exact. She would often express to those that she knew that the "Devil" can have his take at the child once it was born. Apparently, Satan himself decided to take her up on that and when the baby was born, individuals in the community claimed he was, in fact, a demonic monster! It is said that the baby transformed into a massive and grotesque monster. It is stated that he had the head of a horse, a body that was approximately twenty feet in length and reptilian based. The humanoid based creature is also said to have had the wings that reflected those of a bat and a tail that was very long and even forked at the end. This creature is said to have remained at the family home for a short time, prior to disappearing through the means of the chimney that was part of the home. It was at that time that the word spread that this vicious looking creature was roaming the area identified as "Pine Barrens". 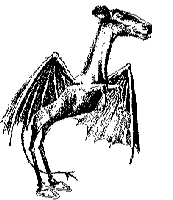 Individuals that lived in and around the small community gave the creature the name the "Jersey Devil". Stories of unexplained disappearances began to spread in the area. Mostly, family pets and farm animals were reported missing. Eventually, though, children started coming up missing. Naturally, the citizens of the community claimed that the mystery creature was responsible for the strange events occurring within the town and general area. Unfortunately, the livelihood of the community became jeopardized because of the missing animals, shortage of fish in the New Jersey Barrens waters, and the resources being invested in seeking out the children that disappeared in the area. The fear in the community spread so rapidly that even adult men were not willing to venture outside their protective shelters in the cover of night. In 1740, a priest that specialized in exorcisms performed this ritual with the community. The effects of this were expected to last a full century. Unfortunately, it has been established that the Jersey Devil has returned to the area at least two different occasions after this occurred and prior to one hundred years passing. Witness accounts from a Commodore Stephen Decatur, and from Joseph Bonaparte who was the brother to the popular Napoleon confirmed this. However, in the year 1840, the mystery creature returned to the area. Individuals in the area would often hang a lantern on the outside of their homes in order to deter the Jersey Devil. In 1909, the mystery creature became such a nuisance that people refused to leave their homes. Many individuals attempted to kill the creature, but it always managed to escape. In 1927, a driver to a cab was changing a tire when he noticed the creature on the automobile. In 1930, it was witnessed in a field eating. In 1951, a group of kids claimed to have been approached by the mystery creature. Several witnesses throughout the years have claimed to have seen or been approached by this mysterious creature. Is the Jersey Devil real, or simply a myth? The individuals that have experienced it agree it is very real, and one of the greatest unsolved mysteries of all time.